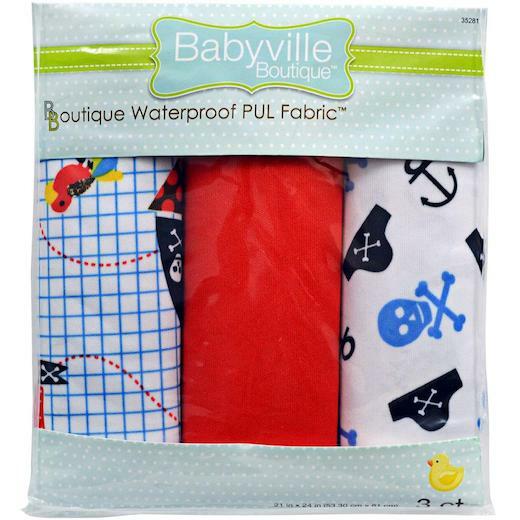 Babyville Boutique PUL Waterproof Diaper Fabric Cuts. A polyurethane laminated (PUL) fabric that is the perfect choice for diaper-making mums and everyone desiring to make adorable, unique diaper covers and accessories. Tested and proven to be safe for baby. Composed of 100% polyurethane coating and 100% polyester backing. This package contains three 21 x 24 inch (53.3cm x 61cm) fabric cuts. Because PUL is a laminate, needles and pins leave tiny holes in the fabric where leakage could occur. To re-seal these holes after sewing, place the PUL in a hot dryer for 20 minutes and you’re good to go!